Scottish traditional music group, formed in Glasgow in the 1970s. 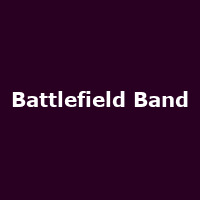 A bedrock of talent for over four decades, Battlefield Band continue to lead the way for Scotland with their inspired fusion of ancient and modern traditional music and song. The band have gone through many changes of lineup- their current members include Mike Katz, Alasdair White, Sean O'Donnell and Ewen Henderson.